Statement in Solidarity with Clients of Transgender Health Empowerment, Inc.
Transgender Health Empowerment (THE) has had to dramatically curtail their services due to financial difficulties, as reported today in the Washington Blade. This reduction happened very suddenly, and services trans community members depend on have been abruptly cut off. Immediate action must be taken to ensure THE clients get services they need to ensure continuity of care. THE has provided essential services to DC trans communities since 1996, and without these services many trans people and LGBTQ youth will be left without access to vital housing and health care services. DCTC stands with THE’s clients and calls on DC Government,as THE’s primary funder, to act quickly to make sure that necessary services continue. DC’s trans communities face significant health disparities, and we must take collective responsibility to ensure that those needs are addressed. 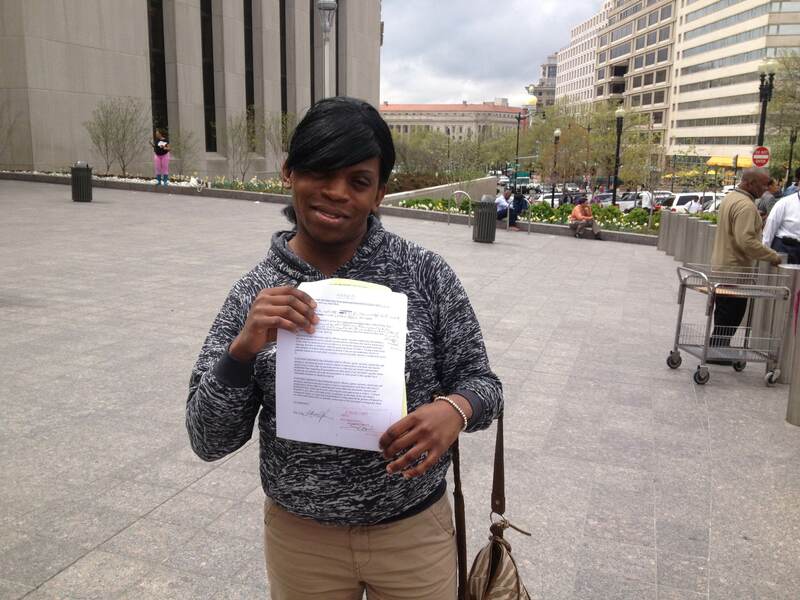 Lakiesha Washington poses with the judge’s order that the John L Young shelter be open to transgender women. A DC transgender resident named Lakiesha Washington, Transgender Health Empowerment (a drop-in center for LGBT people), and DC Trans Coalition have won a major victory for transgender homeless people. Washington, and the lawyer representing her–DC Trans Coalition member Jeffrey Light–negotiated with New Hope Ministries through this last week that New Hope would agree to a Temporary Restraining Order allowing Washington (and all transgender women) into the shelter. Furthermore, New Hope Ministries has arranged to give its staff transgender sensitivity training (as put on by Transgender Health Empowerment’s Earline Budd, and the Mayor’s Office of GLBT Affairs), and improve the privacy of its bathroom and shower facilities so that no one will be outed on the basis of their genitalia. DC Trans Coalition member Andy Bowen, who filed an Office of Human Rights complaint about John L Young in February 2013, will withdraw her complaint, which had just entered the mediation and investigation stage. For more information, contact Andy Bowen at andymbowen [at] gmail [dot] com. DCTC will host its bi-monthly meeting at 7:30pm in the Austin Center at Whitman-Walker Health, 14th & R Streets NW. Get updates on our needs assessment project, our work regarding the police and jails, and help us create our upcoming community forum on December 3 (stay tuned for details). Plus much, much more! Anyone who wants to fight for justice is welcome to attend. We’ve teamed up with TLGB Police Watch and a number of other local organizations for Trans Day of Action. Join us at 1:00pm for a rally in front of Metropolitan Police Department Headquarters, 300 Indiana Avenue NW. We’ll proceed from there to the US Attorney’s Office, at 555 4th Street NW. Check out our goals and demands for the mayor, the police chief, and the US Attorney, and feel free to share details with your friends on Facebook. Please join us for the annual Transgender Day of Remembrance service, organized by Transgender Health Empowerment, at 5:00pm at the Metropolitan Community Church, 474 Ridge Street NW. We’ve lost at least two members of our community to violence this year, and many more have been injured. Help us to honor their memories. After a brutal summer, we are excited to share some positive results from our collective struggle to improve the lives of trans folks in the District. After talks between trans advocates and D.C. Mayor Gray, 21 trans individuals are participating in Project Empowerment’s pilot program to combat transphobic discrimination. NPR has an in-depth look. DCTC is doing all we can to support the participants and make it a success. We are very excited to be part of this ground-breaking effort to address unemployment in our communities, and we hope the District will continue to fund similar potentially life-saving resources. We just passed a major hurdle toward receiving funding so that we can begin Phase Two. Our Needs Assessment Working Group is in the process of designing the paper survey that will soon be distributed. If you’d like to help out, they meet on the second and third Tuesdays of the month. Click here to learn more. In case you missed it, be sure to check out the critically important results from our community roundtable discussions at the Phase One Summary Report. DCTC members recently attended the first ever meeting of the D.C. Department of Corrections Transgender Advisory Council, a new body meant to increase transparency and community oversight into how the DOC is handling trans inmates. We will have more updates shortly! A Corrections officer is currently being investigated for issuing death threats against two trans women. We are following this case closely. DCTC is continuing to work with community members in response to the many recent instances of violence involving trans women and/or motivated by transphobia. Click here, here and here to see media interviews with DCTC members. Adding to our fears that the string of murders was motivated by bias, the makeshift memorial to Lashai Mcclean that was left at the site she was murdered (and near where two other trans women were shot weeks later) has been burned. The death of Gaurav Gopalan was recently ruled a homicide. An arrest was made in the shooting of a trans woman in Southeast. We are working with our allies at Transgender Health Empowerment and elsewhere to organize this year’s Trans Day of Remembrance and other events around November 20th. If you’d like to help, watch for an announcement about the next TDOR Planning Meeting. Members of DCTC have recently attended early meetings with other community organizations who are working to create a new coalition called TLGB Police Watch. We maintain regular communication with the Metropolitan Police Department to express our concern about transphobia in MPD. We want to make sure that officers are being properly trained, and we want MPD to take the recent crimes against trans people seriously. We are preparing to conduct another round of training for the Gay & Lesbian Liaison Unit. We continue to monitor the legal case against Officer Furr, who recently shot at a group of trans people and their friends while off-duty. As is now well known, our communities suffered more violence over the weekend. Most recently, we were alerted by the Metropolitan Police Department at about 3:15am Monday morning of a trans woman who was non-fatally shot on the 2300 block of Savannah Street SE and had been transported to a local hospital. The victim had met up with her assailant, whom she had known previously, and they got into an argument in his truck, at which point he fired a shot at her, which grazed her neck. The victim was able to walk into 7th District police headquarters to seek assistance. Yesterday, MPD arrested the assailant, Darryl Willard, and he was charged with Assault with Intent to Kill While Armed. We will keep you posted as this case moves through the courts. 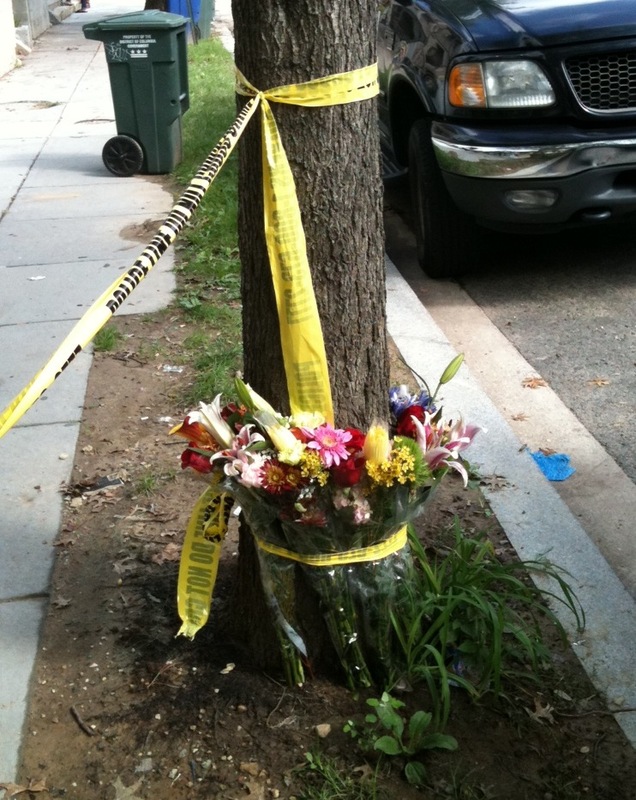 Flowers left on 11th Street NW where Saturday's victim was found. Earlier in the weekend, at around 6:10am Saturday morning, we were informed by MPD that a body had been discovered at 11th & Fairmont Streets NW in Columbia Heights. According to MPD, the deceased person was believed to be a Latina trans woman. DCTC members arrived at the crime scene within an hour, and received an update from MPD’s Gay and Lesbian Liaison Unit. Throughout Saturday morning and again later that evening, several Latina trans community members made phone calls and went door to door in Columbia Heights checking on friends and acquaintances and trying to track down anyone who could not be reached. Around 9:00am on Sunday, DCTC member Ruby Corado was presented with a photo of the deceased by MPD homicide detectives, but was unable to make an identification. The case is being investigated as a suspicious death, and the DC medical examiner has been unable to determine a cause of death. On Monday afternoon, MPD Assistant Chief Peter Newsham held a press conference focused on these two cases, and released a photo of Saturday’s victim taken by the medical examiner. Throughout the press conference, Newsham persistently referred to the deceased as “he” and “a possible transgender male” and used phrases like “he was wearing make-up” and “feminine clothing.” While it is likely impossible for anyone to ever know the victim’s true gender identity, it is important to note that DC’s Human Rights Act, which is supported by MPD’s general order on handling trans people (general order 501.02), also mandates respect for a person’s gender expression. Given the many unknowns surrounding the victim’s death and identity, Newsham — like all officers — should have chosen gender neutral pronouns and should understand the difference between a trans man and a trans woman. We believe that Newsham’s reckless language represents a violation of MPD’s General Order 501.02 and its mandate to be respectful of gender identity and expression, and we will be raising that with both MPD and the Mayor’s office. Within a day after the autopsy photo’s release, a member of DC’s South Asian LGBT community came forward and identified the victim, who is of Nepalese descent. As noted above, MPD’s initial belief was that the person was possibly Latino, which on Monday was expanded to also include possibly of Middle Eastern descent. This raises obvious questions about assigning a racial identity based solely on appearance. Further, the improperly assigned race in this case almost certainly contributed to the four-day delay in identifying the victim, and definitely caused intense fear within the Latina trans community. We understand that members of KhushDC have expressed that they will be planning a remembrance for the victim, we will keep you posted on details as they become available. We also want to acknowledge statements made to the media by DC Mayor Vince Gray and DC Council Chairman Kwame Brown expressing their concern over the extreme violence our communities have faced this year. We look forward to working with them to take concrete action to prevent such violence inthe future. As always, if you have been a victim of violence, or if you know someone who has, you can reach out to us at 202.681.3282 or email dctc@dctranscoalition.org. You can also reach out to Transgender Health Empowerment at 202.636.1646 or HIPS via their 24-hour hotline at 1.800.676.HIPS. If you need police assistance, dial 911 or call the Gay and Lesbian Liaison Unit at 202.506.0714. 1) The Gray Administration is committed to expand cultural diversity training across District Government with a focus on LGBT and specifically transgender cultural competency. a. The Mayor has directed DC Department of Human Resources, The Office of Human Rights, and The Office of GLBT Affairs to begin working on the development of a training module that the administration will pilot and make mandatory for all District Government employees upon full implementation. The Mayor has asked for the training module to be in place for implementation planning by October 1, 2011. 2) The Department of Employment Services will run a pilot of their transitional employment program targeting members of the transgender community. The program includes six weeks of training coupled with subsidized paid employment. a. DOES will have the pilot run of the transitional employment program targeting members of the transgender community ready for implementation by September 5, 2011.
b. The Office of GLBT Affairs will work with DOES to ensure there is community engagement in the development and implementation of the pilot program. We are excited to see such positive progress, and look forward to holding the Gray Administration accountable to these promises. The groups will reconvene in the future to continue the on-going dialog on how to address barriers to trans employment. We also hope that future discussions will include voices from a broader range of stakeholders.